Watching your little one take their very first steps is a really special and exciting moment. However, it also opens up a new world of household dangers. While some are pretty obvious and easy to prepare for, there’s some common household dangers you may not be aware of. So, taking a little time to toddler-proof the home becomes absolutely essential. Here, you’ll discover some of the most common toddler household dangers every parent should be aware of. Did you know that from 1990-2015, window blinds have been the cause of 17,000 injuries and just under a staggering 300 deaths in young children? The majority of these were caused by the cords of the blinds. They also occurred when the child was under adult supervision, but left alone for less than 10 minutes. This is according to a recent report published by the American Academy of Pediatrics in late 2017. If you’re planning on installing new blinds or window coverings, you should also make sure they’re cordless for maximum safety. Besides the actual fire itself, your fireplace poses many dangers to your toddler. If you have a stone or wooden hearth on the fireplace, it can act as a tripping hazard and the sharp edges could pose a serious risk of injury. If the fireplace isn’t correctly secured to the wall, it could also potentially fall on your toddler if they were to somehow pull it over. It’s a good idea to start by checking the fireplace is secured to the wall. Once you’ve done that, consider investing in a fireplace guard. This won’t just protect your little one from getting too close to the fire, but it will also prevent the risk of injury if your toddler trips near to the fire. When it comes to household dangers, the toilet is probably the last thing you think of. However, did you know it can pose a drowning risk? It may sound ridiculous, but it’s entirely possible for your toddler to drown in a few inches of water. Never underestimate the situations toddlers can get themselves into! It’s worth placing a safety latch on the seat so your toddler can’t lift it up. This also prevents the risk of them trapping their fingers. It’s easy for your toddler to lift up the seat and accidentally drop it onto their fingers. So, it’s better to be safe rather than sorry and secure the seat with a latch. This is a fairly broad danger, but furniture can be extremely hazardous to young children. Even your sofa can be a potential choking hazard if there’s things such as coins dropped underneath it or in between the cushions. Bookshelves are another potentially serious danger. Your toddler will see the bookshelf as an awesome climbing frame; using the shelves to pull themselves up. The trouble is, unless the bookshelf is well secure to the wall, it could easily topple over onto your toddler. It’s not just climbing up furniture and choking hazards you need to be wary of either. Many types of furniture have sharp edges which could be extremely dangerous if your toddler was to hit their head on them. So, be sure to continuously check underneath the sofa and between the cushions to ensure there are no choking hazards laying around. Protect against serious head injuries by covering up sharp edges and finally make sure any furniture is well secure and your toddler won’t be able to pull it over. All appliances can be potentially dangerous for young children, but washing machines and dryers are two of the most common toddler dangers. They can not only climb into them, but they can also climb on top of them and fall off. Machines which come with a front-loading feature, are tempting for toddlers to climb into. It’s estimated that around 3000 children are involved in washing machine and dryer injuries every single year. So, if you have a front-loading machine, you may want to invest in a child safety feature if it hasn’t got one. You’ll also want to check there’s no way your toddler can climb up onto the top of the machines. Televisions have come a long way over the past decade, with newer models featuring a very slimline, flat design. While this has greatly enhanced the visual experience, it’s also made it much easier for toddlers to pull over. If the television is situated on a stand, there’s even great risk to your toddler as they could easily use the shelves to climb up to the Television. You can purchase straps which are used to secure the television to the stand and prevent it from being pulled over. However, ideally you’ll want to make sure the television is secured to the wall. Regardless of what type of flooring you have, germs could easily be lurking within it. When you or guests come into the house, there’s a high possibility you could be bringing in pesticides and many other potentially hazardous toxins. Your toddler would then be exposed to them while playing or even crawling on the floor. Always have a good quality welcome mat placed behind exterior doors. That way, dirt and debris will become trapped within the mat, rather than trailed into the home. You should also make sure to clean the mat frequently to maintain its longevity. It’s easy to overlook lamps as a potential safety hazard. However, they’re actually a lot more dangerous than you might think. They pose three main risks – glass, electricity and heat. Your toddler could knock the lamp off, smashing either the glass shade or bulb. They could also burn themselves if they touch the lamp when it’s on. You should always make sure your lamps are weighted down and placed as far back onto a surface as possible. You could use a heavy-duty style Velcro to attach the lamp to the furniture and secure cords onto baseboards, so your toddler can’t pull them and knock the lamp down. Waste baskets are useful to have in practically every room when you have a toddler. However, they could be potentially hazardous for your little one. They can contain a lot of harmful bacteria, as well as pose a climbing risk. So, it’s always a good idea to ensure any waste baskets are hidden in cupboards, or placed into a container with a lockable lid. Is there a room in the house that you never use? Spare rooms can cause problems if your toddler manages to find a way in there. If you use the room to store things there’s also a wide range of hazards just waiting for your toddler. To prevent any potential injuries, always keep any spare, unused rooms of the house locked and secure. 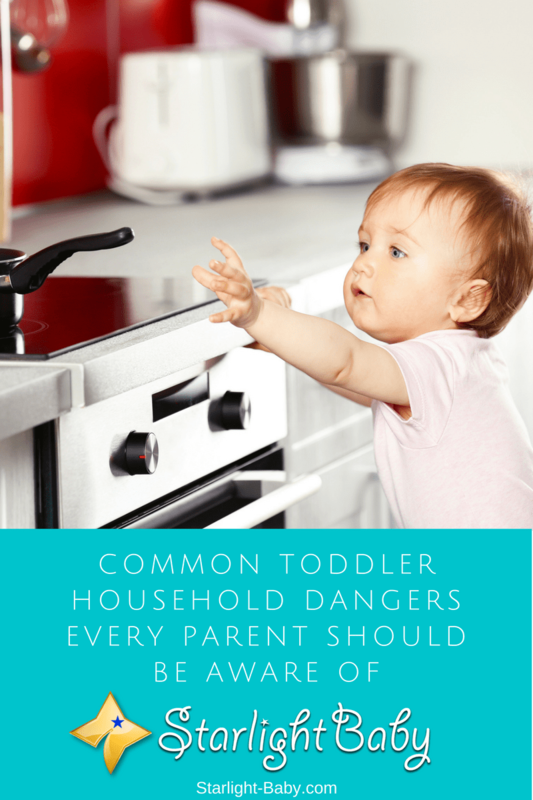 These are just 10 of the common toddler household dangers every parent should be aware of. There’s so many seemingly innocent things you don’t typically associated as a danger to your little one. However, taking the necessary precautions mentioned above, cold save you and your toddler a lot of hurt, stress and worry. These are really serious home potential hazards to kids should the parents not take care in preventing such from happening. I can attest to the flat screen television and furniture hazards very well because my little cousin who is about 7 years managed to pull down one in their home, breaking the screen but thankfully he wasn’t injured. The father now had to go mount the new one he bought on the wall instead of keeping it on the television stand he used to keep it. Yes, these things could become serious hazards to a child so if you could put everything secure or out of a child’s reach, that would be great! Child-proofing one’s house and being keen about potential hazards is a MUST if you have small kids in the house. Exactly, that’s correct. It’s the curiosity of children that puts them in harms way when a parent isn’t careful with how they child-proof their home. These kids would literally go beyond what an adult can think of in trying to discover something that they are curious about and it would most likely lead to their getting injured. My baby will soon begin his toddler stage. Thankfully, I don’t have to worry about window blinds because we don’t have them. We have grills though. We also do not have a fireplace or wooden hearth. However, toilets might be dangerous, but we always lock the toilet door. We don’t let the child unattended because we understand the dangers associated with furniture. Yes, never ever leave a child unattended. Kids move very fast and accidents can happen in a split of a second. I wanted to add that the kitchen is also hazardous for a child. A child can grab a cooking pan from the stove and get scalded, or grab a knife and hurt himself/herself. I have a nephew (a son of my cousin) who suffered from second-degree and third-degree burns in his arms and body when he was about three years old because he grabbed a cooking pot and got scalded by liquid from the beef stew that was boiling in the stove. His skin never fully recovered from the burn marks. It’s great to read about the dangers most of these areas and equipments can pose to our children in the home and one thing I have to say is the need for parents to take proactive measures in ensuring that the toddler play in a safe environment to avoid getting involved in such accident that may bring injuries or even death in some cases. Yes, you’re right. It is important for parents to make the home accident-proof to ensure a child’s safety. As parents, we should be conscious of hazards in and out of the house. Add to this the need to closely watch the kids because they can move fast and get hold of things fast. I totally agree with you on the last part on the need for parents to be able to watch their kids to ensure they play in a safe way. Sometimes, making sure the home is accident proof might not be enough, if the parents fail to watch over their child during the day.